Materials listed below can be used by homeschoolers, math clubs, or with families who want to do extra enrichment at home! Math Templates and Tricks - to access websites with interactive online learning for math concepts, to download useful math templates and charts, and get help with tricks for multiplication, and more! Lots of articles, book suggestions, activities, programs and resources for the homeschooling family or afterschool enrichment. If you need help explaining more complex factoring of polynomials, this series of 6 downloadable handouts and a powerpoint file can help! Nicely illustrated and step-by-step instructions, along with self-discovery built in, can help your student with this sometimes challenging skill. Download free Algebra 1 worksheets or sign up for unlimited customizable worksheets. View powerpoint on how to make and use your own algebra tiles for teaching concepts through manipulatives. PDF with help for parents and their children to understand ‘balanced scales’ and how to solve equations. Look under each of the 14 math topic subsections for lots of book suggestions. Good list of books that tell a story of a math concept or other math topic, compiled by Suki Wessling, with parent ‘Dodi’ on Suki’s blog. Download free lessons/materials for Cuisenaire, Algetiles, or Base 10 blocks OR order other products on their home. Hap Palmer created tons of songs for Math, Language Arts, and child development, which promoted learning through music and movement. Search through lists of math songs to help children learn concepts and then click on CD’s, Mp3′s, sheet music, and distributors to find the ones you want or check your library for the desired books or sound recordings. You can use this checklist to learn about age appropriate math skills learning or even use it as a test or screening tool for children aged 2-6. Tips for encouraging number concepts in young children, including the ‘cardinal principal’ which is the ability to not just count up to a number but to identify a set of objects with its correct amount. Read this article with age-specific skills and activities listed for math concepts and abilities, for ages 1-18. Cut books about puppies and kittens to promote early math concepts such as counting, addition and subtraction, measuring and telling time. This program has been very popular in schools which encourage developmentally appropriate, hands-on learning with real objects. Children learn about patterns, number concepts, attributes, all by sorting, categorizing, and low-tech materials. Purchase the guide books on their site or other booksellers. Learn about Numicon manipulatives and program for early learners (also used for visual or special needs learners.) These materials promote tactile, visual and proprioceptive learning. The only US retailer is the Down Syndrome Education Store. Article with examples and suggestions for easy activities you can make and do with your child to help develop number sense, including one-to-one correspondence, cardinal numbers, conservation of number, and other important early math concepts. Easy-to-make-yourself math activities from objects around the home, (or from inexpensive items) such as ‘jewel’ strings, ‘mystery socks’ ladybug counter, and others – all for children to learn about numbers and counting. Downloadable number counting books to make are also available. 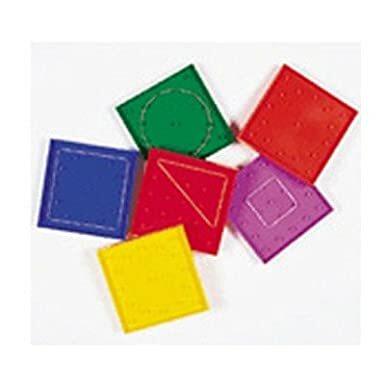 Find free downloadable mat designs for use with pattern blocks, to build early geometry, spatial, and fractions skills. Article with some illustrations of early math learning skills and techniques. Print out your own pattern blocks templates, matching worksheets and pattern blocks activities cards, for early learners. Good list of books like “Sir Cumference, What’s in a Million, Anno’s Counting Book, The Doorbell Rang, and more! A worksheet that isn’t a worksheet! Use the LEGO grid to create math problems and an answer bucket used to post the answers. Good suggestion for coin ‘tapping’ method to learn and calculate total coin amounts. Find directions on making a clock from two paper plates, with the hours printed on the top plate and the minutes ‘peekable’ on the bottom plate, by lifting fold-up tabs. By Jean Stenmark, Virginia Thompson and Ruth Cossey. Order through the museum, Amazon, or your favorite bookstore or available in libraries or homeschool resource centers. Great activities for building concepts in fun family activities. Find fun math challenges for families to do together at home, such as predicting (and then checking) which paper tube would hold more popcorn – the one that is 11 inches long and rolled up from the 8 inch side or the 8 inch long paper tube rolled up by the 11 inch side? Comprehensive list of math programs and resources: free worksheets, math books and e-books, ist of online math games & resources, homeschool math curriculum guide, and math teaching articles/lessons. Parents looking for homeschool math programs or who want to use a program for enrichment beyond the classroom will find suggestions here. Offers extensive list of online resources for algebra: tutorials, lessons, calculators, games, word problems, and books and e-books. Check out the blog and tons of other information on every possible math topic. Also offers books for sale by the webmaster including her “Lets Play Math” e-book, designed for homeschooling math, as well as a list of her favorite math books. This family website details their reading of this book and activities they did to illustrate how this Greek mathematician measured the circumference of the earth, with step-by-step photos, video link and ‘how-to’ text. Program created by a former classroom teacher, this program uses humor and story to explain math concepts. This program has been recommended by parents of children with Asperger’s and to those who haven’t learned math with other traditional programs. Find activities to do with LEGOS for all subject areas. Shares resources for learning, exploring and enjoying math in a dynamic and holistic manner, for all ages. Offers articles, reader lists, reviews, lesson plans and suggested learning ideas, games, and math sites. Good blog with lists and images of early math tools to have around the house, and lots of resources for math learning – books, hands-on math ideas, home-made manipulatives and games, etc. Find fun resources, activities, video suggestions and other activities to do or discuss together as a family. Find standards-based math activities you can make to do at home or in small or school groups, as well as download free printables. Find activities and resources to tie writing in with math. Offers ideas for everyday activities that support math learning, as well as free downloadable games and materials, with more products available for sale. Blog about playing with money: counting, wrapping, and estimating coins. 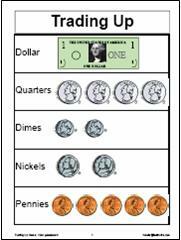 Find “Race to A Quarter” game you can make yourself with the directions on this site; make a simple poster and get a dollar store divided tray to play the trading game, to learn values of coins. Watch this video to learn how to make various platonic solids (cubes, tetrahedrons, octahedrons, icosahedrons and more) at home with tooth picks and jelly beans. Purchase textbooks or take online courses (some fee and some free) for students in grades K-6 who want challenging math curriculum, as well as opportunity to connect through online forum and games. Math Fiction Stories, Math Program Books and other topical math books list for varied ages. “Find thousands of our free mathematics enrichment materials (problems, articles and games) for teachers and learners from ages 5 to 19 years. All the resources are designed to develop subject knowledge, problem-solving and mathematical thinking skills.” Great source for problem-solving activities for students at 5 different skill levels, with the opportunity for problem-solvers to send in their solutions for a chance to be published. Solutions are open-ended so multiple possibilities are accepted. View past challenges and their published answers. Created to help prepare middle-school math students for problem-solving on tests, this site offers multiple problems for each month, along with a solution set published (noting that other answers are possible) in the areas of: number theory; measurement; geometry; patterns, algebra, and functions, and data, statistics, and probability. Suggestions for questions to ask math learners or have them respond to these questions in their own math journal. Helpful for auditory/verbal learners and to help link the verbal for visual/spatial learners. View and download plans to create an abacus made out of LEGO blocks. Find geoboards for purchase listed on Amazon or go to your local educational toy or supply store or borrow from a resource center. Good list of Math resources by level – books, materials, etc. Some free, as well as subscription activities for students, families, and classroom teachers that are challenging but enjoyable and easy to make. Berkeley Lawrence Hall of Science Handbook with atypical math class activities to interest and challenge both sexes with fun games, problem-solving, logic, spatial challenges, as well as math career awareness. This is a great tool – a large rod with colored rings which the user slides along the math line – for all basic operations and other skills such as money, rounding, and more. This tool is relatively inexpensive (under $20) and engages the student through tactile, visual, movement and logic. Buy the larger one with four lines to do decimals, fractions and percents. Also offers free downloadable or viewable powerpoints, videos and sample lessons. Use these realistic printouts to cut out and use for money activities – includes bills and coins. Find resources to help you help your child create math journals, to visualize and discuss math concepts and procedures, as well as to facilitate concept development, logic, and math language. A dictionary of mathematical terms from abacus to zero, with illustrations, diagrams, and cross-references. Search libraries, bookstores or used books sources for this helpful resource. Offers a geometric educational program through manipulative building blocks. Download catalog or buy products online. View pics and diagrams on how to make 5 different types of platonic solids, as well as snub, tangles, hyperbolic, and fractals, with balloons. Learn about and purchase this specialized number game board that is used to teach patterns and relationships between numbers, including their factors, multiples, and squares through a variety of games which build pattern recognition. It is a relatively inexpensive way to play and learn number patterns that help with multiplication and division facts, factoring, fraction work and more. Find out about the block system that teaches mathematical, geometric, design, and architectural concepts. Purchase sets or books, share your photos and creations with others, get free downloads of models to build, computer programs, and other resources. Sets can also be purchased by toy and online sellers. Web-based, computer program which uses adaptive questioning to determine exactly what a student knows and doesn’t know in a course and then provides demonstration and practice. Classroom or home use, at the students own pace. This free downloadable math lesson book series offers lower and upper primary students a very different math instruction from most books, with chapters titled things like “The languages of strings and arrows” and with activities and explanations which seem to be geared toward gifted, or at least accessible to analytical, visual, and auditory/story learners. Popular series for algebra, trigonometry, and more. It reads more like a story with clever ways to look at the material. Many parents recommend it for Asperger’s or more auditory learners, rather than visual spatial learners. Look for it at Amazon or other book stores. Offers relatively inexpensive computer software and i-pad app for math program from 3-12 grades, which uses visually interactive software to teach math concepts and calculation. Read about and purchase Mathematics: A Human Endeavor and upper level math texts, entitled Elementary Algebra and Geometry: Seeing, Doing, Understanding, which all emphasize constant review with creative learning and “engaging text with its use of meaningful illustrations and references to culture, literature and art.” Also offered are teacher texts and book of test masters for each textbook. (Also available at Kaleidoscope) Offers step-by-step, easy to follow, few problems per page, help for students with LD or for basic intro or review of fractions, decimals, measurement, percents, geometry, metric measurement, and algebra. 866-586-6622 (for local centers and materials) This program focuses on worksheet practice with repetition of skills and concepts. Offers comprehensive worktexts and workbooks for K-12th grade math subjects, used by homeschoolers (check out homeschool buyers coop for group discounts) and others. Download free samples from the website. Popular and effective lower cost complete instructional program, using manipulatives that help the student to visualize concepts. Teaching videos, teacher guides, student workbooks, placement tests, etc. Uses manipulatives (Cuisenaire rods) observation, investigation, and the discovery of patterns through workbooks which assist in exploration of mathematical relationships. Detailed online downloadable pdf with instructions on teaching math concepts and procedures, with visuals. Right Start Mathematics uses the AL Abacus to provide a visual, auditory, and kinesthetic experience in learning math. Parents like these traditional textbooks as they circle back around with review to keep skills sharp. Highly visual math textbooks, illustrating concepts and procedures, with minimal text on primary books. Used by homeschoolers and others, students can use the workbooks or a CD set with math lesson videos to learn concepts and solve problems, as well as use other CD’s to help them when they can’t solve a problem or did it incorrectly. Levels go from Level 3 up to Pre-Calculus. A way to play while learning your times tables, with folded paper ‘pies’ you make yourself. Pinch the triangles together and cover up the answer and then test yourself or a friend. Purchase the relatively inexpensive DVD and book to teach math facts through a visual/spatial technique for ‘right brain learners’. Explanations on how to use tricks to mentally figure out problems of all operations, often by doing the opposite operation or thinking about a smaller problem. Learn how to do “Casting Out Nines,” ”Multiplying by Using Base Numbers” and many more! Good sets of mathematical problems offered for students to decide whether they are sometimes, always, or never true, and then must give examples that prove why they decided the way they did. Solutions are included. Find challenging puzzles, perhaps for older, more experienced, or gifted students. Links to websites with problem-solving activities, brain teasers, logical thinking & puzzles, and other resources. Watch this film online or on Netflix to see how origami and paper-folding are a form of geometric math. An ”Award–winning documentary, Between the Folds, chronicles the stories of ten fine artists and intrepid theoretical scientists who have abandoned careers and scoffed at hard–earned graduate degrees—all to forge unconventional lives as modern–day paperfolders.” For those who are interested in the science, art, and theory of paper-folding, this film is full of amazing and thought-provoking issues, including topics in geometry and medicine. Find lists of family movies (parents should check them out first for appropriate content) that include a scene or topic about math, with information, worksheets, and the topics covered in each film or clip. Watch student-made videos about area and perimeter, how to calculate elapsed time, and parts of a fraction. This is a good example of a different kind of learning that happens when children have the opportunity to explain what they have learned in a fun way and it might spur your child to do the same! Watch videos that explain Tom Biesanz’ right brain technique for finding patterns for memorizing times tables. Watch videos on math uses or careers, math activities, or modeling math concepts. Also on this site is support for teachers, math curriculum development, and information on all STEM academic areas. Fun and cool videos on “Doodling in Math Class,” Pythagoras, and many others. Workbooks that teach basic math and pre-algebra topics such as decimals, fractions, and percents, as well as high-level math such as Calculus, with real-life situations such as shopping sales, buying a cell-phone, baking cookies, travel, and more. Free printable worksheets (with answer sheets) from this online site on all basic math and algebra skills, including number sense, decimals and percents, integers, order of operations, and much more. Print out worksheets on most math and algebra skills. Select the math topic from the Math Worksheets Menu and choose from a wide selection of good worksheets for specific skills under each topic. Offers comprehensive selection of free downloadable worksheets, with topics and formats not usually found with other worksheets, such as finding coordinates and handling data.